Thousands of people defy a government ban on demonstrations and pour into the Algerian capital for a pro-democracy rally. Thousands of people on Saturday defied a government ban on demonstrations and poured into the Algerian capital for a pro-democracy rally, and the head of the country's human rights group said as many as 400 people had been arrested. Ali Yahia Abdenour, who heads the Algerian League for the Defence of Human Rights, said women and foreign journalists were among those arrested during the five-kilometre-long march to 1 May Square in the city's centre. The demonstrations in Algiers came just one day after weeks of mass protests toppled Egypt's authoritarian leader Hosni Mubarak. A crowd that organizers estimated at 10,000 skirmished with riot police attempting to block streets and disperse the crowd. Officials put the turnout at only 1,500. Reports suggested that heavily armed security forces far outnumbered the demonstrators. 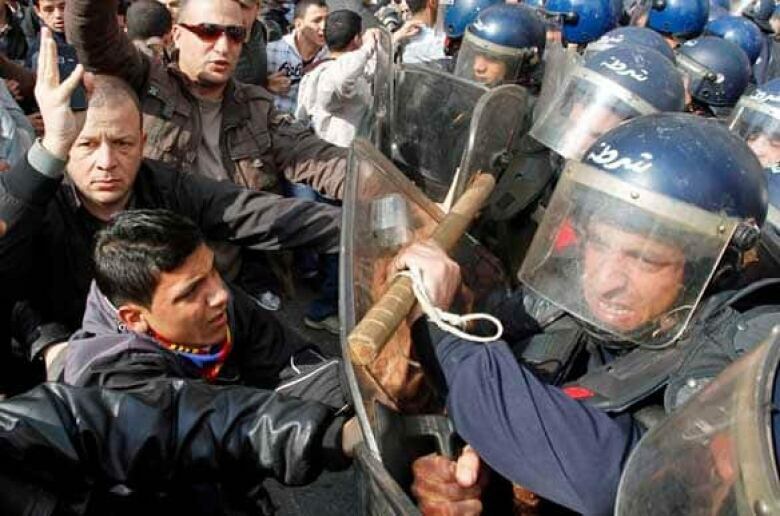 The Algerian daily newspaper La Liberte said an estimated 28,000 riot police had been deployed in the capital. Police tried to seal off the city, blocking streets, lining up along the march route and setting up barricades outside the city to try to stop busloads of demonstrators from reaching the capital. Protesters chanted slogans including "No to the police state" and "Bouteflika out," a reference to President Abdelaziz Bouteflika, who has been in power in this sprawling North African nation since 1999. Under Algeria's long-standing state of emergency — in place since 1992 — protests are banned in Algiers, but the government's repeated warnings for people to stay out of the streets apparently fell on deaf ears. The march comes at a sensitive time, just a day after an uprising in Egypt forced Mubarak to abandon the presidency after 30 years in power. It also comes merely a month after another "people's revolution" in neighbouring Tunisia that forced long-time autocrat Zine El Abidine Ben Ali into exile on Jan. 14. The success of those uprisings is fuelling the hopes of those seeking change in Algeria, although many in this conflict-scarred nation fear any prospect of violence after living through a brutal insurgency by Islamist extremists in the 1990s that left an estimated 200,000 dead. Saturday's march aimed to press for reforms to push Algeria toward democracy and did not include a specific call to oust Bouteflika. It was organized by the Co-ordination for Democratic Change in Algeria, an umbrella group for human rights activists, unionists, lawyers and others. One activist called the protest a key turning point. "This demonstration is a success because it's been 10 years that people haven't been able to march in Algiers and there's a sort of psychological barrier," said Ali Rachedi, the former head of the Front of Socialist Forces party. "The fear is gone," he said. In a bid to placate militants, Algerian authorities announced last week that a state of emergency that has been in place since 1992, at the start of the Islamist insurgency, would be lifted in the "very near future." However, authorities warned that even then the ban on demonstrations in the capital would remain. Authorities had offered to let Saturday's demonstrators rally in a meeting hall. The army's decision to cancel Algeria's first multiparty legislative elections in January 1992 to thwart a likely victory by a Muslim fundamentalist party set off the insurgency. Scattered violence continues.